Mike “The Grinder” Mizrachi is closing in on his second World Series of Poker bracelet, his first coming earlier in the 2010 WSOP at the $50,000 buy-in Players Championship. Mizrachi will have to battle through 11 other players looking to win the $10,000 Seven Card Stud World Championship including the man who finished second to Mizrachi in the Players Championship, Vladimir Schmelev. Schmelev heads into the final day of play with the chip-lead –Mizrachi is in third—and would love to extract some revenge after coming up short to Mizrachi less than a week ago. Also standing in the way of The Grinder are top pros like Men Nguyen –who was a participant in one of the most memorable final tables in WSOP history, when Men had a few too many Coronas and shot beer across the table toward Chad Brown and Ted Forrest. In addition to Nguyen are Joe Cassidy, Dan Heimiller and Eric Buchman. Heimiller already has a runner-up finish in the 2010 WSOP –event #4 Omaha 8 or better—and is still looking for his 2nd WSOP bracelet. Heimiller has a total of 37 WSOP cashes in his career, and has cashed in every WSOP since 1997! 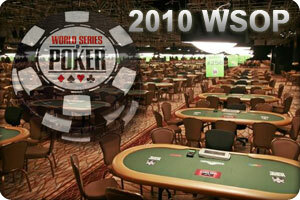 This entry was posted on Sunday, June 6th, 2010 at 12:28 pm and is filed under Poker News. You can follow any responses to this entry through the RSS 2.0 feed. You can leave a response, or trackback from your own site.